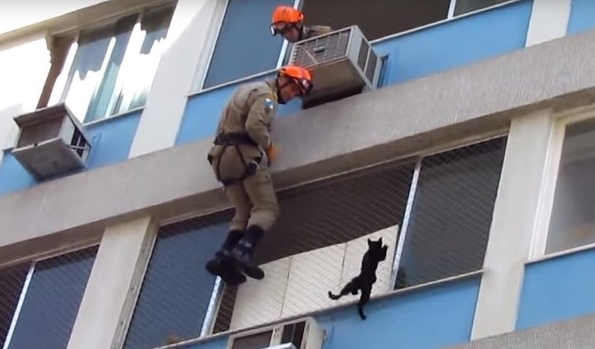 A cat who was trapped high up an apartment building is back on solid ground once again, all thanks to — or perhaps in spite of — one of the craziest pet rescues ever caught on film. Despite the rescue not going quite as planned, the incident ended remarkably well for the cat. Afterward, firefighters dropped her off with a local animal rescue group. A staffer there told that the animal suffered no broken bones in the fall, and is expected to soon be reunited with her owner — who will be given a few tips on how best to keep windows secure for pets. Responses to "Cat Survives One Of The Craziest Pet Rescues Ever Recorded "
They did not catch her in the blanket, she bounced off and ran off! HOW did a kitten get there? Some human put her there , no doubt....I watched it a few times MUTED, because I cannot stand that stupid woman screaming! Who the hell screams when a kitten is so scared ! ? AND some one in the next window ( with bars is closing the window so the kitten cannot get in that way ! ) I know the Rescue men thought they were doing good, but he should have had gloves !